I've quickly found that if I don't take the time to make a journal entry of my activities, new activities pile up and then nothing happens. I'm sure if you've read my entire journal, you would find this thought repeated (unsuccessfully at times) throughout. Today is December 8th. The air is cold here in Cedar City with outside temperature around 32. But the sun is our and the deserts of Southern Utah are supposed to reach 58 degrees today. I had planned on climbing a couple unranked peaks on the East side of Zion. I've been in the area numerous times, but seems like someone is always posting new (unranked peaks) to some of the websites I follow. Not that I need to climb every peak listed, but it just looks bad having unclimbed peaks in some of my favorite areas. I opted instead to hike Angels Landing. I didn't sleep well last night and according to my new Whoop fitness tracker my recovery is poor. The main reason for doing a hike today... besides not having hiked in a month. Is to test the new tracker. I bought the tracker with the expectation of a busy climbing season in 2018 as I tackle my 60 peaks for my 60th birthday year. The tracker gives me an expectation of how recovered I am, therefore giving me an idea of how much I can put out (energy wise) for the day. My goal is to get some idea of the "Strain" on different ascents so I can better time climbing vs. recovery days (and still make a living too). The shuttle system is closed, the entire road through Springdale is dug up for construction leaving only 1 lane. It's a Friday morning and I'm thankful as I catch the line of cars just at the tail end so I don’t have to wait to long. The drive up the main Zion canyon is stunning, a few icicles are hanging from some of the lower slabs, but no snow or ice is visible on the summits. I catch another break as a car is just pulling out of the Grotto parking lot as I pull in. The lot is full, but not designed for the abundant use the park has seen in recent years. A few people are milling about ready to start, or just returning from their hike. I pull on my pack, start my Whoop tracker and make my way to the trailhead. 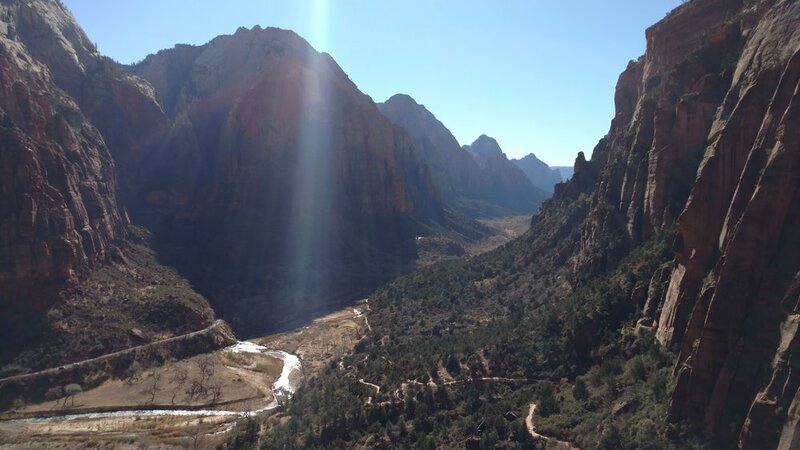 Angels Landing is not unlike other popular adventure hikes. Deaths have occurred over the years and the trail is listed on almost every "Top Ten" list you can find on the internet. This has resulted in - quite literally - hordes of people coming to climb Angels Landing. During peak summer months it is not unusual to see a line of humanity along the entire ridge line to the summit. Today thankfully, I nod at the occasional hiker as we pass on the trail. I eat my lunch at Scout Lookout, then head to the "chained" portion of the trail. This is where within just a few hundred feet a person should get the feeling of "if" they should continue or not. It's been awhile since I've been on steep slickrock, but it feels like home compared to the cement walkway leading from the trailhead to the lookout. As I wait for an individual to work their way down, hand-over-hand, I marvel at how long this hike would take with hundreds of people on the trail. I move along the same chain, then across some mild slickrock to the next series of chains and see the female companion of the person I let go by. I thought she was sitting, waiting for me to pass. But she said with surprise "you are walking across this area! I have to crawl". I moved fairly swiftly, only having to stop once in awhile to catch my breth or to let someone coming down the trail pass. The summit was beautiful, and I finished eating my snacks. The trip down was uneventful and the entire trip took less than a few hours. Best yet, I finally achieved my highest daily strain number on my Whoop, so it was a good test of what I can expect this summer. Better still, after a month of not hiking, it was also a gentle reminder of the grace I feel while in the mountains and I shouldn’t put it off from week to week.